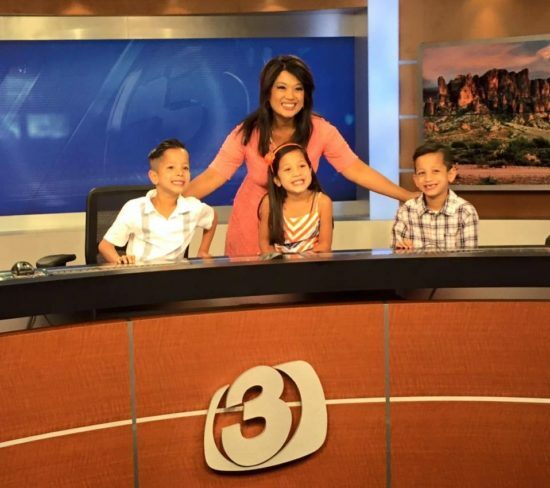 A beloved member of the local news team at Channel 3 in Phoenix, Tess Rafols has been sitting at the “AZ Family” anchor desk for over a decade. 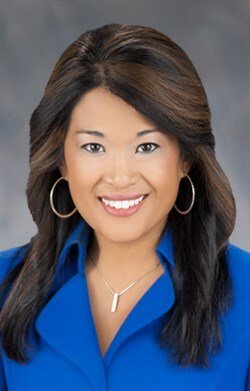 She has a real passion for her work and it shows through her connection with viewers, guests on the show, and the station’s crew. Tess is the real deal — she is just as nice, kind and down-to-earth in person as she is on TV. 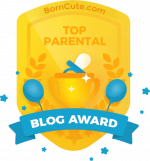 On a personal level, Tess cites her proudest moment as the birth of her beautiful children. 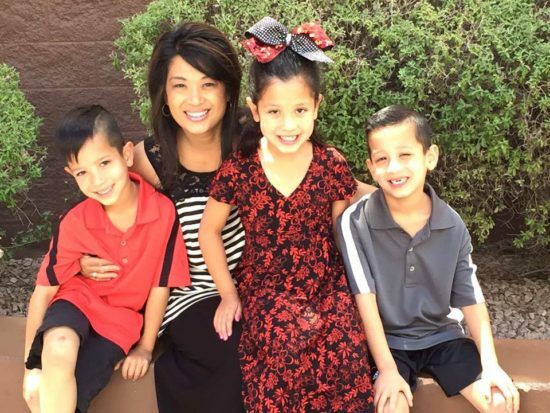 While being a mom to triplets comes with its challenges, she wouldn’t have it any other way. 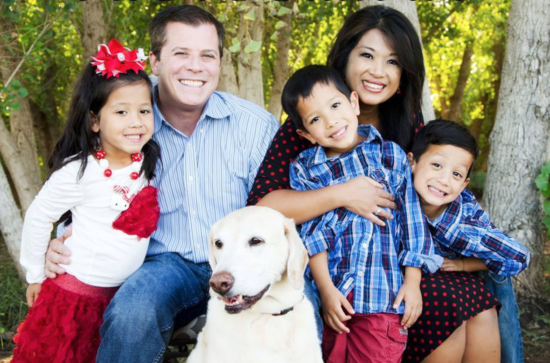 Now 7 years old, Cooper, Jaxon and Zoey are in first grade and Tess loves to volunteer in their classroom and participate in their extracurricular activities as much as she possibly can. Tess celebrates Mother’s Day 2016 with her kids. Tess’ on-air style is polished and professional, but approachable. Bright solid dresses and statement necklaces are go-tos, with an occasional print thrown in to shake things up. Her off-duty uniform is more casual and practical for running around as she balances her three minis’ busy schedules, but always pulled together. 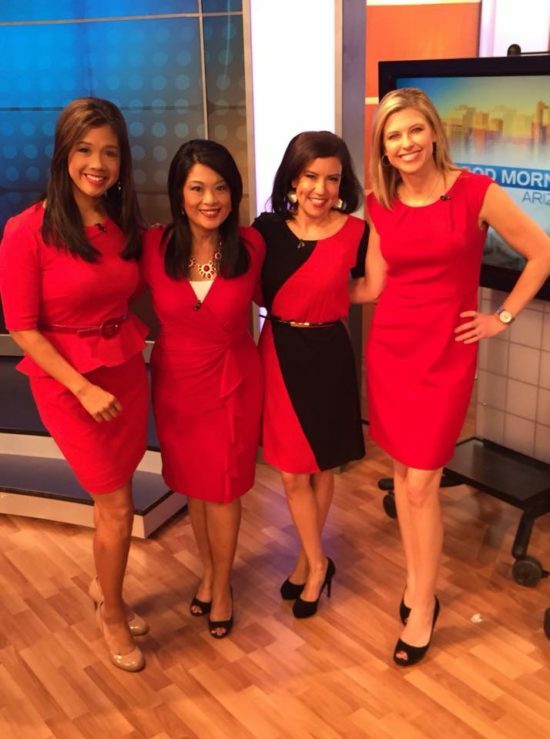 A color-coordinated day for the dynamic Good Morning Arizona news team! Although she grew up in Southern California, Tess considers Arizona home now, having spent much of her adult life here. Her family is tight-knit and her parents and sister have played an instrumental role in helping her and her husband Vic raise the triplets. 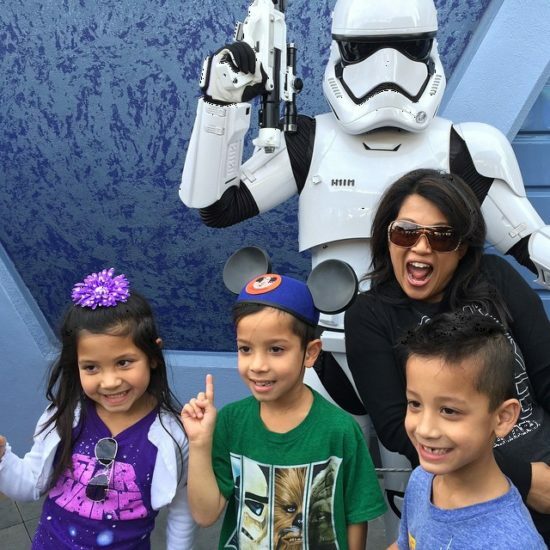 The group often takes trips together; Disneyland and San Diego are among their favorite destinations with the kids in tow. In her spare time (when she’s not dashing off to one of the kids’ many activities! ), Tess makes it a point to be involved with community events. She especially enjoys working with animal organizations and children’s charities like the March of Dimes, Boys and Girls Club and Stepping Stone of Hope. My love for helping others and because I love to talk! Seriously, I always aspired to be a lawyer. In fact, I was a pre-law major at University of California – Santa Barbara. After two years of classes, I re-evaluated the direction I was headed. I realized what I loved about being attorney was the research and writing/presenting an argument in court, fighting for someone and being their voice. 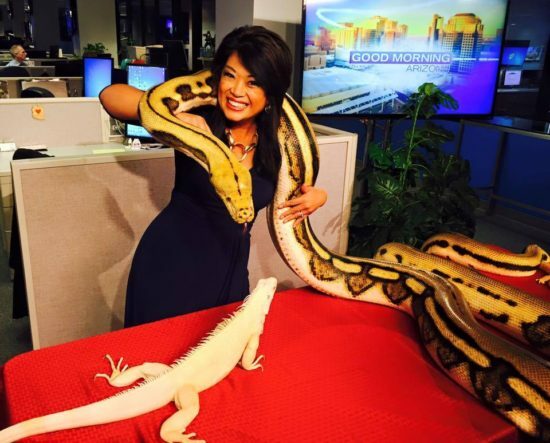 A career counselor suggested I go into journalism. I transferred into USC’s School of Journalism and the rest is history. What inspires me today is being able to tell someone’s story, to be able to reach someone through a story and to make a difference in that way. 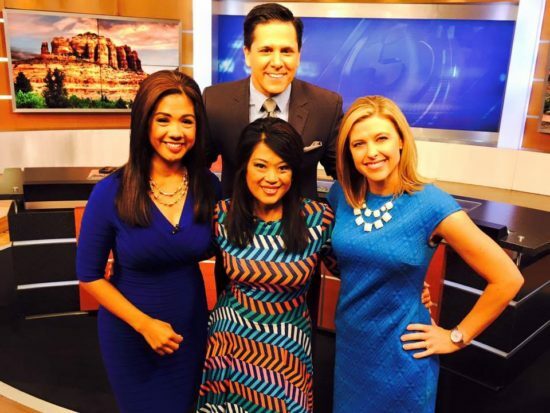 Tess in-studio with the Good Morning Arizona news team, Gina Maravilla, Javier Soto and April Warnecke. 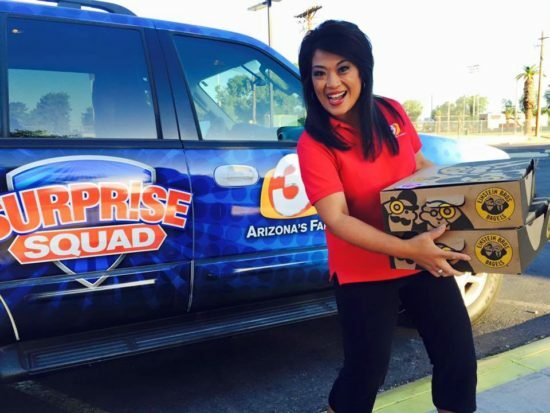 A recent morning when Tess and the Channel 3 Surprise Squad surprised the nurses at Phoenix Children’s Hospital with breakfast. The best parts about my job: Being able to tell someone’s story, helping others and making an impact through the stories I tell, and meeting people from all walks of life. How much fun is her job? 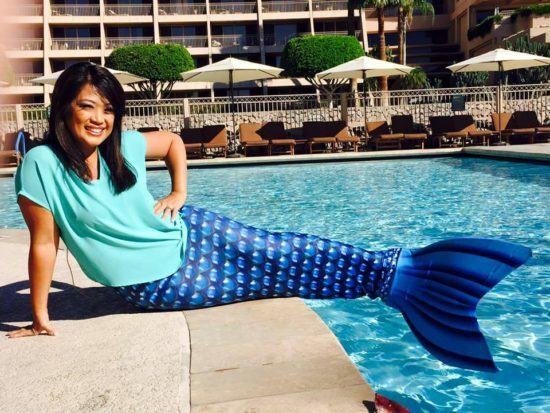 Tess reports on Mermaid School at the Phoenician Resort in Scottsdale. White flowy skirt, big bright-colored bag or tote, and a long necklace. Before kids, I was very OCD. I had a notebook where I would write down what I was wearing the night before, including every detail from my jewelry to my shoes. (Ok, I was crazy!) Once I had kids, I just didn’t have time for that! So now, once I wear something, I hang it on the right side of that group of clothing in my closet so I don’t repeat as often! I also rotate out my accessories – from jewelry to belts – to change up a look. Best choice for on-camera or a station promo shoot? Tess rocks bright solids that flatter and pop on screen. 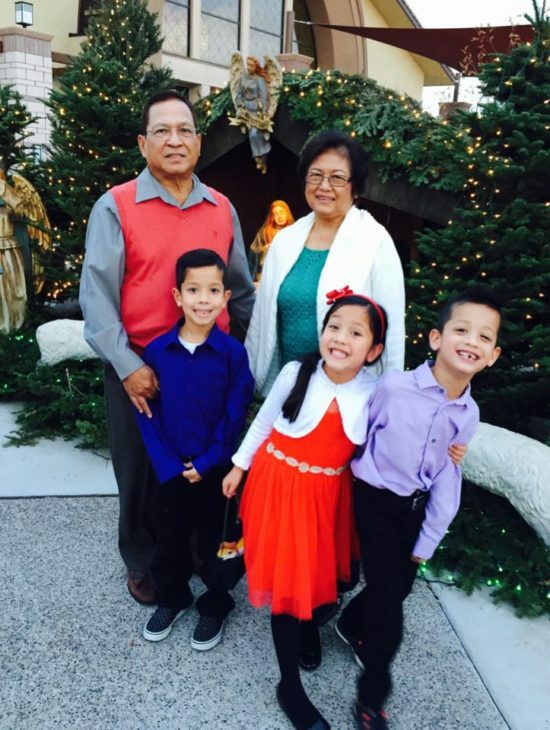 MSL: Having triplets must be a challenge at times, how do you keep it all together? Any secret tips you can share? Following a pretty regular routine is crucial for our active lifestyle — it keeps the family on the same page. But on the flipside, being able to go with the flow is just as important. The secret in balancing work, family and multiples is not trying to do it all yourself and not being afraid to ask for help. I used to be a control freak, but after kids, I’ve realized I can’t do it all myself. My husband, parents and sister are a huge help in everyday tasks. 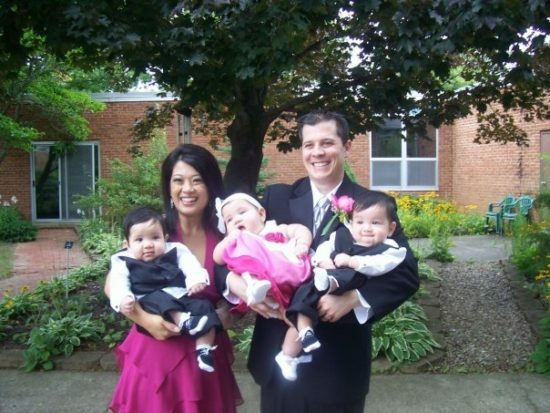 It truly does take a village to raise kids, let alone triplets. The triplets with their amazing grandparents. MSL: What’s your favorite part of motherhood? Least favorite part? There is nothing like seeing your child smile out of sheer excitement and happiness, or how your child’s hug can turn your day around and make everything ok. The best part of motherhood is feeling that unconditional love you have for your child and being loved back. My least favorite part? I don’t know if I really have one, because even the bad stuff (tantrums, tears, sibling fights, etc.) is all part of the experience. I guess my least favorite part is that time flies too fast. I wish I could keep them little longer, to savor each moment more. Going to the “Dark Side” with the kids at Disneyland. Flashback to when the triplets were babies. Adorable! I studied classical piano for about 10 years. I love to sing karaoke (but have a horrible voice). And, as a kid, I won a few hula-hooping contests! I truly believe if you aren’t comfortable in what you’re wearing, you won’t look comfortable. Your style should be a reflection of who you are from within, not necessarily what’s trendy. Also, make sure to look in the mirror before you run out, because who hasn’t worn something inside out or backwards at one point?? Definitely not a good style. I love watching Tess on Channel 3! It’s great to learn more about her personally. Love it. I like the way Tess reports news. Her consistently calm demeanor makes it easy to believe what she’s saying. I was excited to hear that she would be having triplets. Although, I had 3 single births & can’t imagine carrying 3 for 9 months!